A few years ago my mother gave me this mini cake pan. 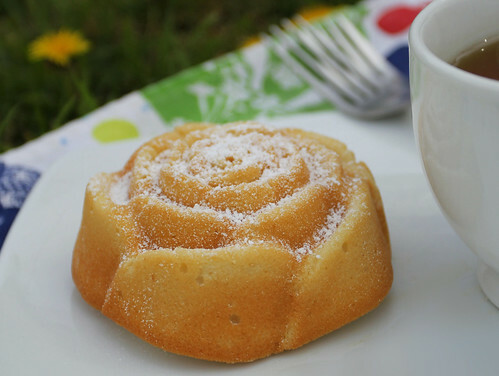 Each mini cake takes the shape of a rose, sunflower, or daisy. I looked at the flower molds and decided that rather than one vividly colored and candied cake, I would make something more simple and subtle to welcome springtime back. Since I decided to avoid frostings, icings, and chemically colored sprinkles, I went with something very light. Vanilla and almond. I used Martha’s vanilla cupcakes as my foundation, and made only one small change to the recipe. Heat oven to 350 degrees. 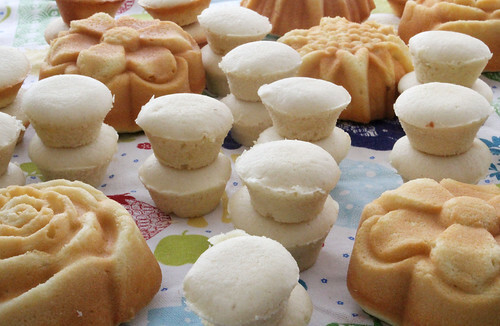 Line cupcake pan with paper liners or generously spray flower-shaped mold with cooling spray and dust with flour; set aside. In a medium mixing bowl, whisk together flour, baking powder, and salt. In another mixing bowl, cream the butter and sugar until light and fluffy, about 4 minutes. 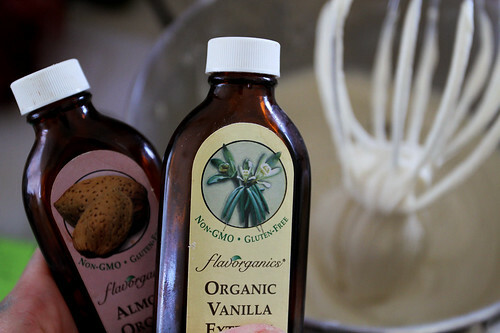 Add eggs one at a time, mixing until incorporated and scraping down sides of bowl, beat in vanilla. Add flour mixture and milk alternately, beginning and ending with flour. Scrape the sides and bottom of bowl to assure the batter is thoroughly mixed. Divide batter evenly among liners, filling papers about 2/3 full. Bake on the center rack of the oven until tops spring back to touch, about 20 minutes. Transfer to a wire rack to cool completely. Dust with confectioners sugar. 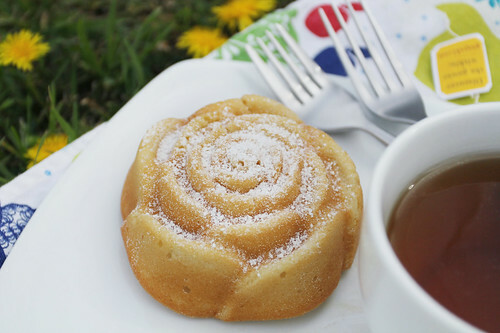 …and I ate my flower cake in the garden with a cup of tea near a patch of dandelions. The cake was moist, lightly sweet, and wholly satisfying with a cup of Chai Spice Mate Tea. While I was sitting on the grass, a ladybug landed on my hand. The ambassador of good luck! Here’s hoping you all have a happy and lucky springtime!! I love this entire post and it made me so excited to start planting in my garden! Also, are the paper liners you used in the pan the shape of the flowers or were they just normal? I was just trying to figure out how they still took on the shape of the flowers with the paper liner in there. Hi Brittany! Thanks so much for the nice words I’m SO excited that spring is here! I clarified the text above a little more… it was rather confusing. 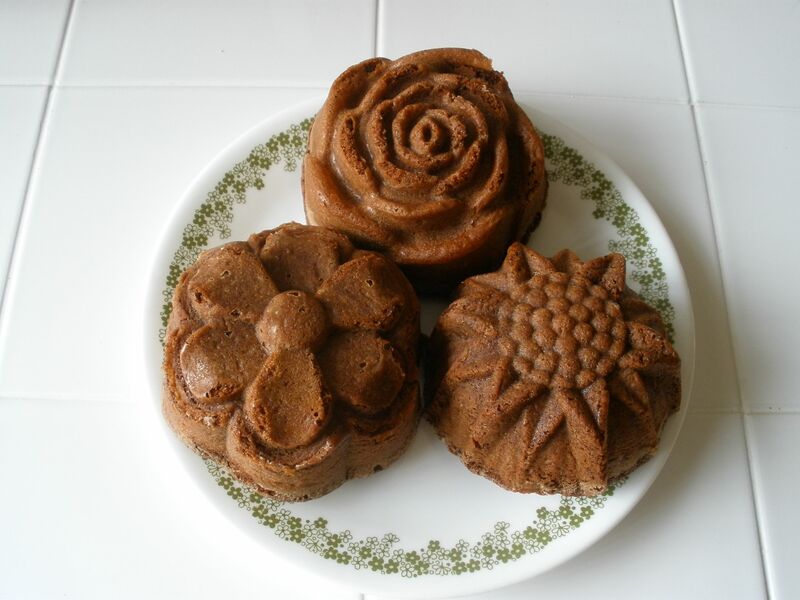 You can use plain old paper liners if you are going to bake regular cupcakes- but if you use the flower shaped mold, I would just spray the heck out of the pan with cooking spray and dust with flour. (I cheat and use the Pam baking spray that already has flour in it) It works like a charm! Every single flower cake came out beautifully. – No paper liners needed with the flowers. You just opened such a huge can of worms by posting those pans! I absolutely love them. That spread of spring time desserts is just too alluring. I think that from now on all of my cakes will have a similar theme 😀 Thank you so much for this! I can’t believe you did all this without me! Your life is magical. I love it. Do you own a King Cake pan? How large is your cake pan cabinet? Your flour garden looks delicious! CasitaMama- My cupboards look like a game of Jenga. The husband dares not enter them… Wish you and your sweet peas were here to enjoy the cakes with me! Miss your face!! !